Is your company planning a retreat this year? Stuck on ideas to make it memorable and special for your company’s valued employees? Then it’s your lucky day! We’ve gathered some information on great venues and activities in the tri-state area that just might be what you’re looking for in 2012. As always, Hello Productions loves to plan retreats and company meetings, and we would be happy to help you build on any of these or other ideas for your next event! Seven Oaks is a beautiful, private country club situated in Brighton Township, PA, with numerous amenities and options for your next corporate outing or retreat. They pride themselves on putting forth the same professional service to meetings and banquets that they do to individual members, outing attendees and brides. By making this a one-stop shop for your retreat in terms of hosting a golf team-building activity, meetings, catering and of course, the scenery that will take you away from it all within a short drive from the city, it’s a great option for your next corporate event. While you’re in Beaver County, why not consider kicking off your retreat weekend with a private group tour and cocktail reception at the beautiful and historic Merrick Art Gallery? Or, if you’re looking for more action, perhaps a trip to the Darlington Polo Club to watch an exciting a match and enjoy a tailgate under the lights might be what you’re looking for? Glenmoor Country Club, voted “Best Retreat Location in Ohio” by the readers of Inside Business Magazine, is home to a Jack Nicklaus Signature Course, an 18 Hole Championship design that combines challenge and beauty in perfect harmony. They also have a State of the Art Practice Facility including a driving range, target greens, putting greens & chipping green. Glenmoor CC caters to all of your golf events and planning needs at an exceptional value, and can also house your guests at The Bertram Inn on site. Glenmoor also offers such amenities as a full European Spa for those attendees who don’t or would prefer not to golf. With a wide variety of pre-packaged retreats available, as well as the option to create your own unique company event, Glenmoor provides all of the tools at a reasonable price needed for a fantastic event. While staying at Glenmoor, consider a day trip to the Pro Football Hall of Fame to see and experience all the history and excitement of the game! Once you come back to the Country Club hungry, consider having a private cooking demonstration and dinner provided by their Executive Chef in the Black Heath dining room. The Stonewall Resort, a Four Diamond-rated property nestled distinctly in the mountains of West Virginia, features 208-guestrooms with a lakeside lodge and lakeside cottages, a conference center, restaurants, complete fitness center and swimming pool, spa and an 18-hole Arnold Palmer Signature Golf Course. With approximately 15,000 square feet of IACC approved conference space and exceptional outdoor venues, the resort can host corporate events with ease. There are no shortage of team-building opportunities available at this mountain oasis, including indulging at the Mtn. Laurel Spa, Guided Segway/Hiking/Biking Tours, Lake and Fishing activities, the Little Sorrel Lake Cruise, as well as the aforementioned Arnold Palmer Signature Golf Course- and this is just to name a few! The available activities in the vicinity of the Resort are endless! How about a crazy but educational dose of fun when your group visits the Trans-Allegheny Lunatic Asylum, featured on the Sci-Fi Channel’s “Ghost Hunters,” in Weston? Both late-night Paranormal tours as well as Historic Tours (including a tour of All 4 Floors+Medical Center, Civil War Tour or Photography Tour) are offered throughout the week. For something a little more tranquil and, dare we say “sanity-promoting,” consider heading to Lamberts’ Winery for a vineyard tour, tasting and pairing class after a day of workshops. Whether hosting a one day or a multi-day conference or retreat, The Barn at Fallingwater is a unique site that will allow you to create the ideal event for your business or organization. The Barn itself is a converted historic Pennsylvania bank barn, located about 500 yards north of Fallingwater at the entrance to the Bear Run Nature Reserve. By combining or using their distinct settings individually, you can create a memorable group retreat. The Barn has all the modern amenities you might need for group training and teambuilding exercises, all the while taking you out of the hustle and bustle of the city within a short drive. The proximity to Fallingwater allows you to create the perfect ending to your conference – take an interesting tour of the house followed by a social hour complete with music, catering and lush scenery on the bridge. Of course, The Barn at Fallingwater offers you the unique opportunity to walk to the fantastic gem that is Fallingwater, built by Frank Lloyd Wright between 1936-1939. In-Depth tours are available for groups, offering you an inside look into the design, architecture and story of the home and its surrounding grounds, as well as non-guided tour opportunities to take in the beautiful, natural scenery that is part of the property. Why not consider a group scavenger hunt while you’re on the trail? To really get your group’s hearts racing, look no further than the whitewater rafting trips offered by Laurel Highlands River Tours? Not quite ready for the Class III experience? Tamer all-day teambuilding can be had with their fun Kayak and Canoe Instructional Courses, complete with lunch for the whole group at a reasonable price. Keep in mind that your company’s retreat should be designed to accomplish certain but small corporate objectives, while keeping true to the real idea of a “retreat” (defined in the Merriam-Webster Dictionary as A. a period of group withdrawal for prayer, meditation, study, or instruction under a director, and B. an act or process of withdrawing especially from what is difficult, dangerous, or disagreeable.) We all need and deserve a break from the daily pressures of our work lives, and a corporate or group retreat should be designed to offer that to your attendees, as well as to provide you with a forum to motivate and rejuvenate your team in a non-work environment. Have a great time “retreating” in 2012! For help with or for more ideas on creating the ideal retreat, please contact Lindsey at lindseyb@helloproductions.com today! Looking to throw together a fabulous last minute St. Patrick’s Day party? Here are some tips and tricks from Hello Production’s event planners! Saint Patrick is the patron saint of Ireland and is credited with bringing Christianity to Ireland. While we think of gold coins and shamrocks, Saint Patrick is probably most known for driving snakes out of Ireland. While there are no snakes in Ireland today, many believe the snake was more a symbol for driving out pagan practices at the time, not the actually reptile. So how did we get from Saint Patrick and snakes to green beer and luck? Thanks to the home country of Saint Patrick, the holiday is now closely associated with anything Irish: green and gold, shamrocks and good luck. Some theories suggest Saint Patrick died on March 17, which is why the holiday is celebrated that day each year. Saint Patrick’s Day may have started as a religious holiday in Ireland, but today it is recognized throughout the world. Whether you’re having a few friends over for a casual get together or want to have an Irish-themed dinner, make the day all about the details. Pick up a bottle of green food coloring and go to town! Add one-two drops to a fun Irish Beer or a several drops to a homemade punch. If you’re planning on baking something with green food coloring, stop by a specialty cooking or craft store for gel food coloring (such as Wilton’s Icing Color). Gel allows you to easily control how much you’re using and produces a richer color. If you’re not feeling up to baking, place an order for delicious cupcakes at one of the Dozen Cupcake locations (dozenbakeshop.com). For the main course, plan on having traditional Irish dishes such as Irish Soda Bread, Corned Beef and Cabbage, Irish Stew or Shepard’s Pie. Have Irish Whisky or Crème de menthe for (adult only!) after-dinner drinks. 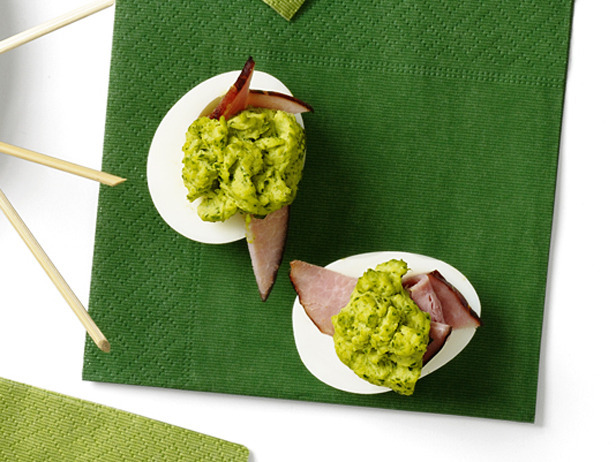 We love these Emerald Eggs as an easy appetizer from the Food Network Kitchens. While there are some beautiful green flowers and plants available this time of year, if you’re looking for an easy and low cost centerpiece ideas why not get a bag of green apples and several bunches of green grapes? Pile them up in a glass bowl or stack them on a cake stand. A few gold springs from a craft store will add an eye-catching sparkle. Not only can you pull it together at the last minute, but it’s edible once the evening is over! To set the mood with some Irish tunes, iTunes has you more than covered with groups such as The Chieftains, The Irish Rovers, the Irish Tenors and The Corrs. Have kids to entertain at your party? Most party stores have gold-wrapped chocolate coins right now. Pick up a few bags and hide them around the space. Have the kids (either individually or in teams) try to find all the “gold”. Having a girls’ night? 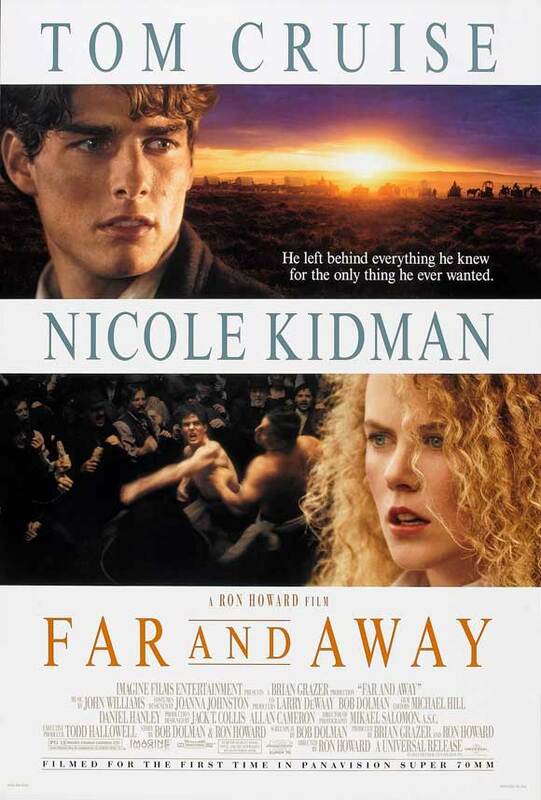 Add a drop of green food coloring to your favorite white wine and rent one of these “Irish” movies (think: Far and Away (1992), Once (2006) and Leap Year (2010)). Have fun because on Saint Patrick’s Day, everyone is Irish! 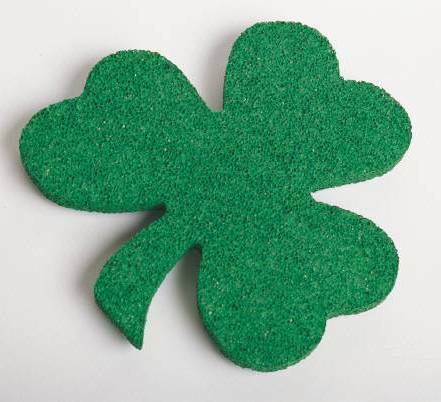 Want help planning your St. Patrick’s Day party? Call us at (412) 298-7333 or visit www.helloproductions.com. Right: Style 508 by Alfred Angelo $$. Left: Alvina Valenta Style 9246 with Tulle and Chantilly Lace $$$. This Alfred Angelo cocktail-style dress is so unique, and would really stand out on your maid of honor. Perfect for a Spring or early Summer wedding, this dress would also translate beautifully into something you could wear to a social affair or even as a guest at another wedding! It is so stunning with the ruffled left shoulder. The Alvina Valenta dress is so classy, and definitely suited for the fashion-conscious bridesmaid. This style would be beautiful on a variety of body types, and would give your bridesmaids the option to pick out shoes with a pop of color associated with your wedding to really give the look its “wow” factor. I love this Jim Hjelm dress for its simplicity, as well as its wearability- and who wouldn’t love the surprise of the open back as she walks down the aisle? It comes in a variety of colors with contrasting ribbons at the waist to complement a wide variety of color stories. Your bridesmaids would be dressed with modesty, but not without style in this dress, and they could wear this again and again through the Summer and even Fall months with a dressy cardigan or wrap. Right: J. Crew Arabelle in Silk Chiffon $$$. 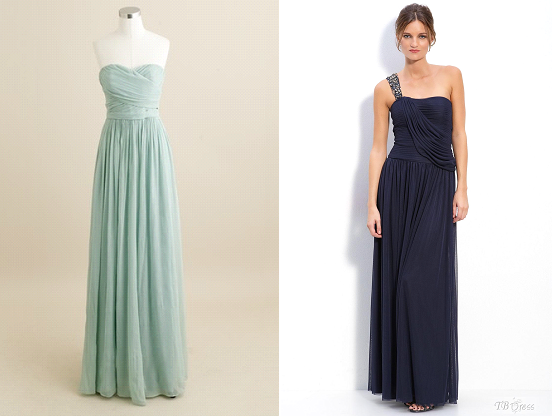 Left: Floor-length, One-Shoulder Dress by TB Dress $. I love the versatility of the J. Crew Arabelle dress. There are numerous colors available, and this dress could easily be personalized with a sash or festive pin to make it unique to each bridesmaid. The ease-of-wear of this type of dress is also a major bonus! This dress would also be perfect for a late Summer dinner and theater date, ending with long stroll hand-in-hand with your sweetheart. The TB Dress one-shoulder style is elegant and classy, with a touch of architectural flair with the front draping. It is also available in a variety of colors, and with the beautiful beading on the shoulder, would allow your bridesmaids to wear a simple pair of sparkling studs to complement the overall effect. This dress would be lovely for your next charity gala or company’s holiday soiree! Right: David's Bridal Satin, One-Shoulder Ruched Waist Style 84333 $. Left: David's Bridal Spaghetti Strap Chiffon Style 83961 $. Both of these David’s Bridal dresses are sophisticated yet playful, perfect to complement any wedding theme. They are both available in a myriad of colors, and would be easy to wear out on a great date or even to an office party. The one-shoulder, ruched waist design is a beautiful silhouette on most body types, and could be paired with long, flowing waves or a sassy updo. The spaghetti strap dress offers your bridesmaids the option of wearing a long, sparkling necklace or shoulder-swooping earrings to complement her personal style. With a jacket, the chiffon dress could go from uptown office to evening drinks in a snap. The satin style could easily be Fall or even Winter-ready with a long wrap and patterned hose. I love how both are so easy to wear again! Yes! If you’re picking out your bridesmaids dresses for them, keep their individual body shapes, personal style and your wedding theme in mind at all times. No one dress usually fits every girl! If you’re torn, allowing them to choose similar dresses with differing necklines or dress shapes (A-Line vs. figure-hugging cocktail) may be a great option. If you want everyone to have the same dress, it’s a great idea to let each girl pick out her own shoes, hairstyle or sash to give them some individual style while not detracting from the main attraction- the bride! If you’re the bridesmaid, I hope that we’ve given you some good ideas and a starting place for your journey on the bridal party train of your friend or loved one. There’s no reason that you should be uncomfortable in a dress or maxing out your credit cards just to be a part of the big day- never to wear “that dress” again! If you or the bride have any questions or would love to have some help and guidance planning The Big Day, please contact Lindsey at Hello Productions today at lindseyb@helloproductions.com.